Hungarian Vizsla Forums > Vizsla Problems > Behaviour Problems > Very Aggressive Behaviour… towards People AND dogs! We have a 17 mth old, Coda, who about 5 months ago began showing very aggressive behaviour towards dogs.. at first. It is now gotten much worse and can be directed towards people (men women and children) and dogs. Just depends if he feels like he wants to attack them or not. He is such a loveable dog and is a great listener. We have done obedience classes and socialized him extremely well. We have discussed this with the breeder… no evidence of this aggression of any sort in his family line. We are doing intensive correction and praise and doing all that specialist tell us to. The next step is to get his thyroid checked. We were advised to do this… completely connected to some aggressiveness in dogs. Re: Very Aggressive Behaviour… towards People AND dogs! Well, I wish I could offer some help. The thyroid check does sound like a good idea, and I would pursue that. Just so you know you are not alone... When Willie goes to the Vet, he is a happy and well-mannered dog who loves everyone. The staff AND the DVM (Dr. Tim) all say that they have seen plenty of aggressive Vizslas; very high-strung and aggressive, and that Willie is exceptional in this regard. My previous dog, a Vizsla mix, had the same kind of loving personality as Willie has. I have had to try to convince them that aggression isn't normally a trait found in the typical Vizsla personality. So again, in your situation, I would try to find a medical explanation. There has to be a reason, as this isn't typical. Thanks for your concerns and help! We will look into this test asap.. it is really weighing on my mind, and although some people are saying that this can be found in vizslas… most are saying it is abnormal. I honestly hope we find a medical reason behind all of this! Wow, this sounds like a scary situation to be in.
" Thyroid problems in dogs impact the metabolism of most cells in the body. Conditions include hypothyroidism, which is the production of too little hormone and hyperthyroidism, which is over production of hormones. " Not sure where the aggression fits here. Thyroid problems seem to translate into tumors if not now, later in life. About 10 years ago had a GS puppy and when he turned 15 months old was flying, ready to fight at a drop of a hat. Turns out he did not have proper leadership. Every time my cousin visited the dog behaved very well. Not sure what he was doing to him but it was not treats training. The above post deals with other dogs. That part is easier than aggression towards people. Seek professional dog people who UNDERSTAND hard driving hunting dogs. A good male hunting dog is driven and being "social" didn't have alot to do with a successful hunter. 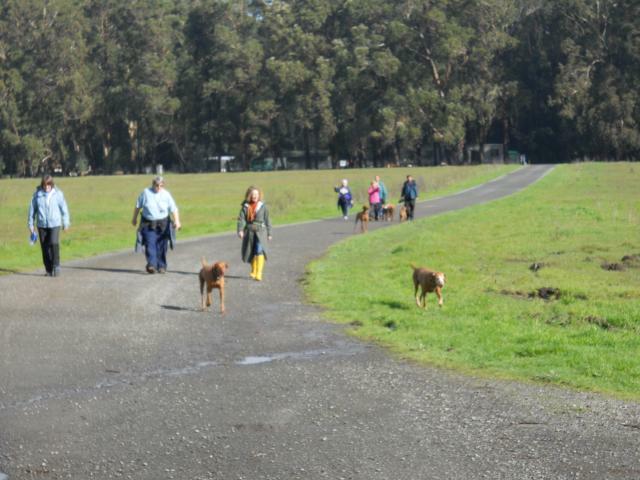 Socialization is able to be done but it takes you taking your dog out every day with people. Stay out of dog parks. These are ready made problems for hard driving hunting dogs. I never take Bailey to a dog park anymore. He is a strong intact male. Was "mugged" serveral times in dog parks. You don't want a pattern like that to start. Good luck. Dozens of posts regarding this throughout my blog. Indeed, GS dogs are different. Drive is also different. Not sure if neutering early @ 6 months would have an impact on aggression later in life. Pretty sure doing it later in life has no effect on aggression. I was advised to strongly consider neutering our Vizsla boy @ 6 months! But the problem which concerns me is the story with the Thyroid gland the post originated with. Never thought Thyroid problems lead to escalating aggression over time. PS Redbirddog, just read your link in the post above, great info, thanx for taking the time. Interesting theory about the tyroid. Can you remember the 1st time Coda was aggressive? What was the situation? Is it possible that the initial aggressive signs were reinforced in any way? What does "intensive correction" mean? I think it's great you are taking the steps to rule out any medical issues first. Sorry for all the questions, especially if they sound judgemental. No judgement Just curious. Can you remember the 1st time Coda was aggressive? What was the situation? Is it possible that the initial aggressive signs were reinforced in any way? What does "intensive correction" mean? I, too, am curious about the behavioral aspect of it just in case the cause isn't medical (hoping there is a medical reason). My question is- did the aggressive behavior begin on a leash while walking past other dogs? Kian, was neutered at 11 months and he started to show signs of aggression at the age of 22 months, now he is 27 months old and we still deal with his aggression towards other male's from time to time. We literally had to start his training over. Showing him that WE ARE ALPHA. He is such a stubborn boy that some days he does push his limits with us, we just have to stay on top of him and call him in if we see a possible problem with another dog. I personally stay out of dog parks now, it's not worth it for my dog to get in a fight. He will pick the wrong dog and probably get hurt very badly. He has been tested for thyroid and his levels are fine, so it's just something we have to work on with him. He is an intense dog and when he gets in that "zone" he needs to learn to cool it off when he plays with other dogs. It's still something we are working on and I hope that he gets it sooner than later. You are all so supportive! Coda was nuteured at 9 months old.. he was showing "uncalled for" behaviours around other dogs. But, he was just the nicest and sweetest dog until about 4 mths ago. The aggression began when my father came to visit us, entered our home, and coda did not like this. He was fine after about 3-4 minutes after meeting him. Again, this happens now if someone comes to our home (only certain people), it can be on walks, on leash, off leash( but we dont let him off leash now if we see others) and even in the car when we are passing a person he is not into or even a dog. Remember, this doesn't happen everytime.. just who he feels he wants to bark at. We are doing sublime training, so positive rfn, calmness etc… but it is ALWAYS. Every second of the day we have to be on him. .So thats what I meant about intensive. Maybe just intensive for us! I am happy to say that my father in law arrived yesterday, and Coda was amazing. We were advised to put a soft muzzle on him when greeting dad, and we did. They met outside and all was good. We were so proud. Things can easily change though… as of today he is doing well..
We are trying to keep in in "low stress" zone… calming methods. The vet is away and we are looking into getting a thyroid test done on him next week. Luckily we have insurance!